Fab cover art and nice Latin set featuring an unusual cover of Mack The Knife found buried on side 2. 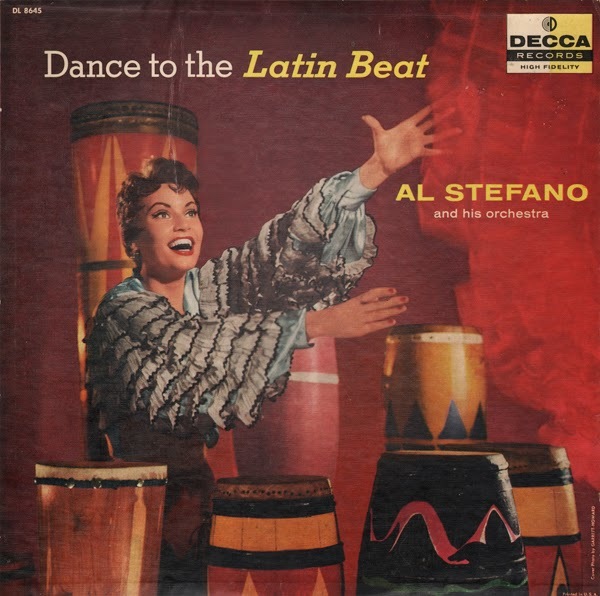 From the back cover: Beginning as a drummer, Al formed his own orchestra about three years ago and is already firmly established as one of the leading Latin American dance bands. 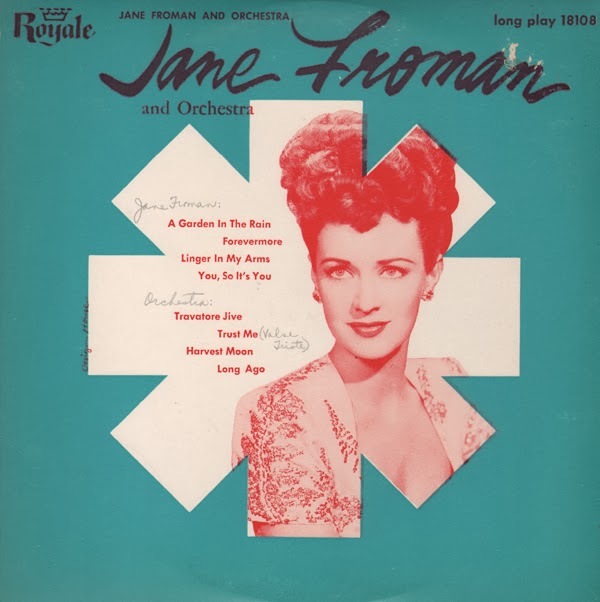 This orchestra can be heard over all Continental broadcasting stations and their records are sold in more than twenty countries around the globe. Also check out Cha Cha and Rhumba Favorites. I'm not a big fan of Chacksfield and the cheap cover treatment didn't help help make the sale. None-the-less I bought the LP to hear Chacksfield's Goldfinger cover. Surprisingly, this could be the best Chacksfield album that I can remember listening to. It's a fine mid-60s light pop album and even though the audio technology is, for some reason, mono (London did release a stereo press PS 416)… the sonic quality on this mono release is excellent. Lush big band arrangements spiced with a "late night dancehall mood vibe". With a deep, full sound made possible by a great engineering. 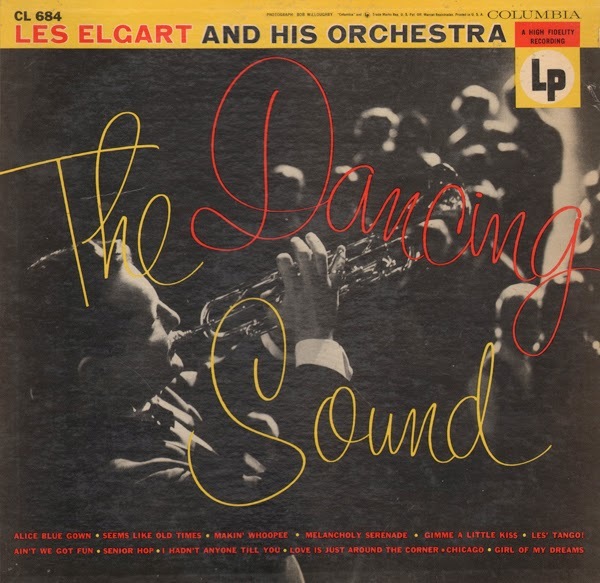 From the back cover: In Elgart's own words, the bias of the orchestra is described: "We didn't want a pounding sound. We want it to flow and be good to dance to and play with. Furthermore, this is largely an ensemble band, which is why it's able to work the class spots and appeal to both college kids and the older groups. We give them the melody, but within a good musical context." And that is what is heard on this collection: melody, but with solid musical ideas about sound and texture surrounding it. Remo Records Corp. - New York, N. Y. 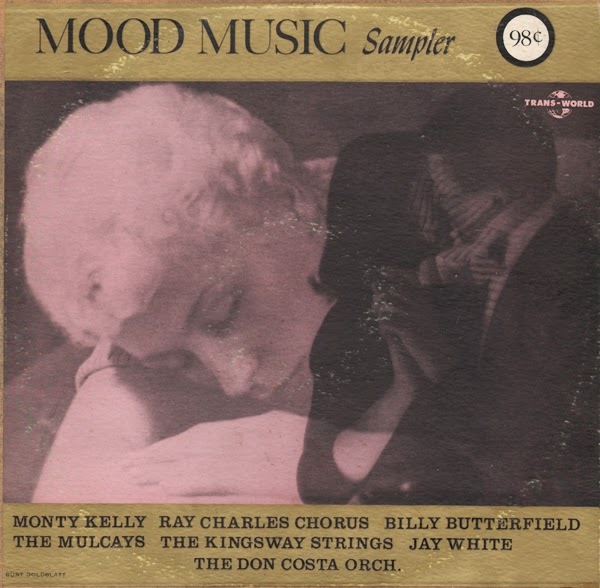 This is one budget LP that features an interesting cover design which sets the tone for a decent compilation of mood including this fine Butterfield track which is also included on I'm In The Mood. 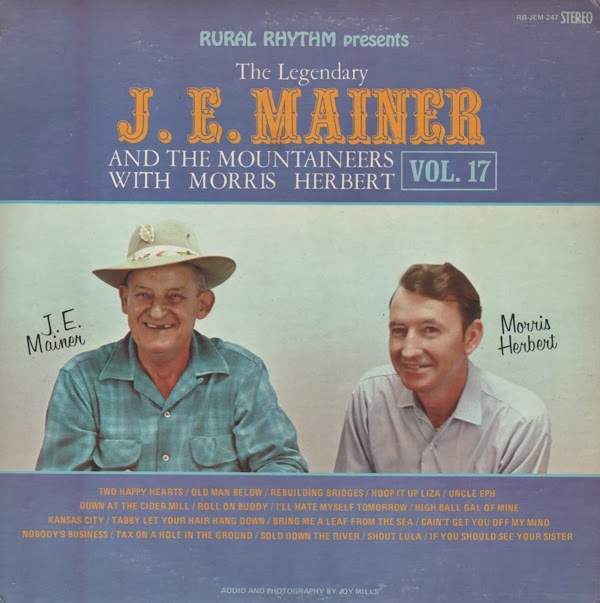 A singing blues number from an otherwise more straight forward "mountain music" LP. 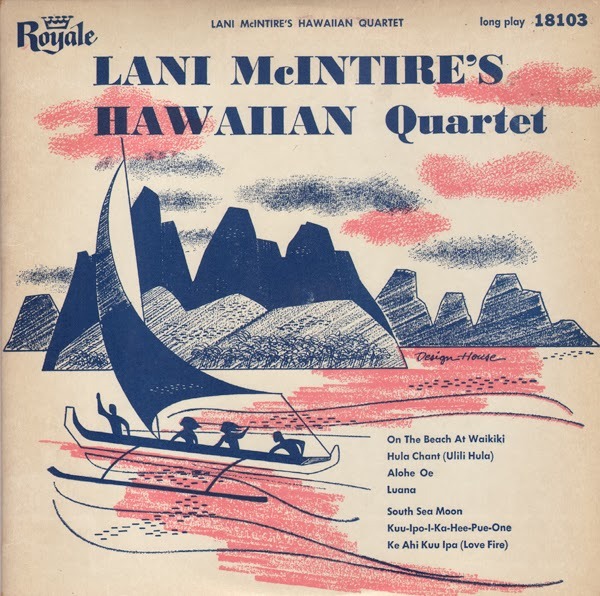 Surprisingly good Royale Hawaiian 10 inch 33. Budget split 10 inch 33. 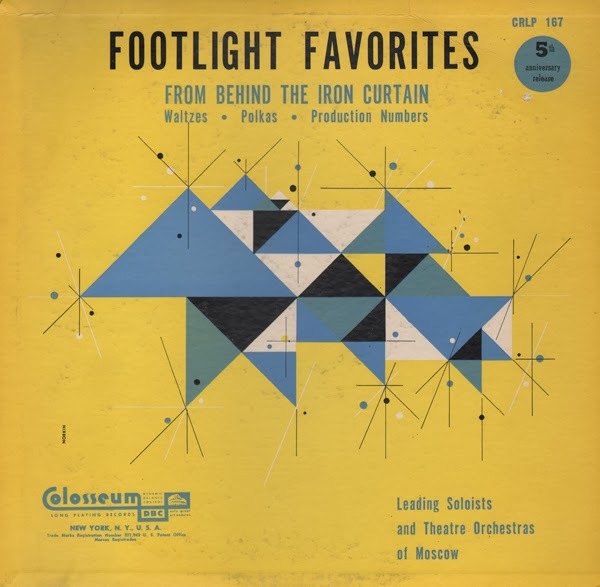 Four Forman tracks and four studio orchestra tracks. Lush, sophisticated arrangements flavored, from time to time, with a hint of the pop sound you hear in many Command LPs from the period. Good stuff! 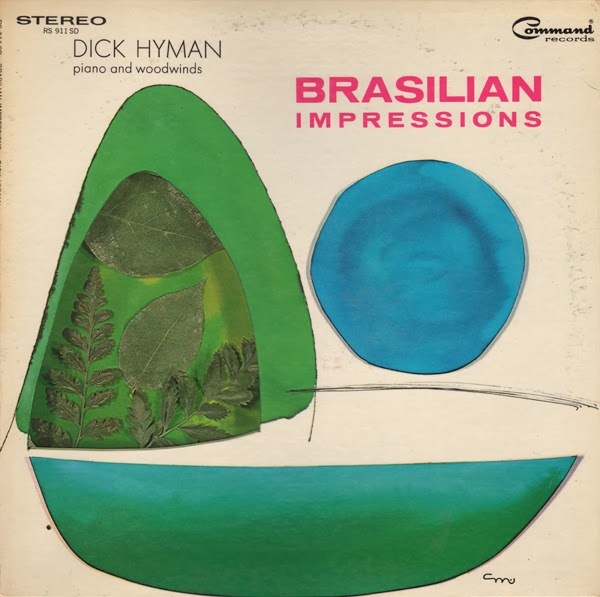 From the notes: "Bossa Nova," he (Hyman) points out, "is not an accurate term any more. It is now being used generically to cover things that go well beyond the earlier conception of bossa nova. Bossa nova was a development of the samba but now there are all kinds of other sambas being played. This new music also has more jazz in it than the bossa nova did and the exact bossa nova beat is now often implied rather than specifically played." Also see Make Mine Mambo. 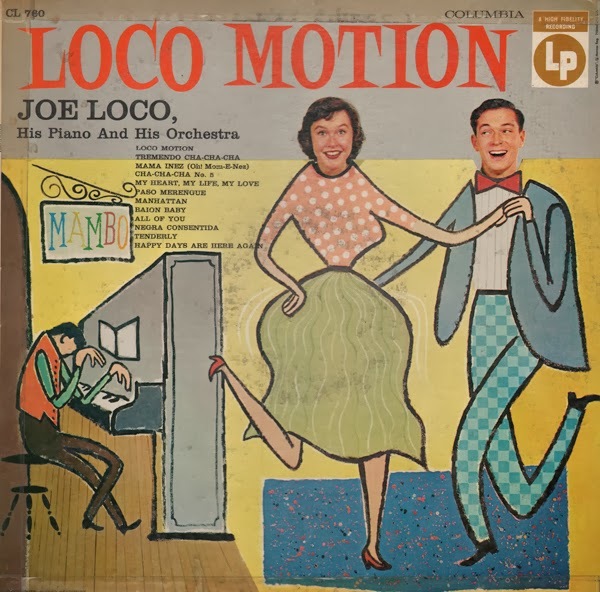 From the back cover: For his debut on Columbia Records, Joe Loco presents a lively program of the tingling music that has made him one of the most popular instrumentalists and band-leaders of the day. Beginning in 1946, Joe and his music have advanced the mambo, the merengue and the cha-cha-cha to dominant positions in popular dances, and have made recordings of domestic and Latin tunes that have sold in the millions. 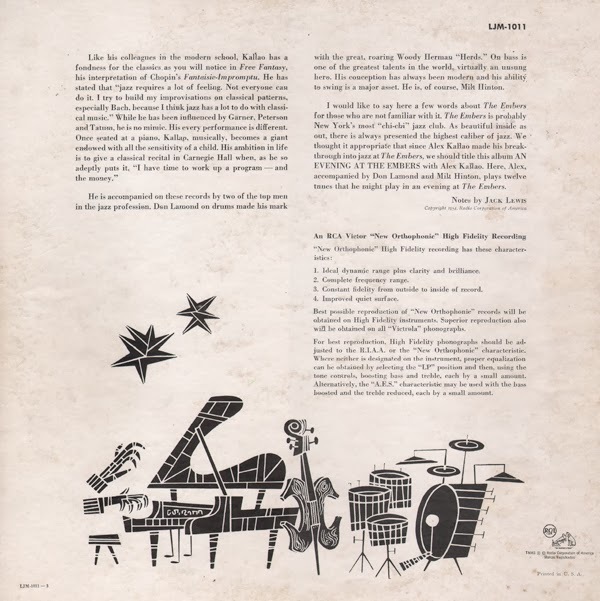 The reasons why are not hard to discover; they are all included in this program, with it's infectious rhythms and happy tempos, and most of all in the glittering piano playing of Joe Loco himself. Joe Loco was born, Joe Esteves, in New York City, in 1921. At the behest of his parents, he began studying violin and dancing at the age of nine. Joe didn't think much of the violin, but progressed swiftly in his dancing lessons, and, by the time he was thirteen, was making professional appearances. After a lengthy tour in vaudeville, he returned to school and began to study piano and other instruments, and before long he was an accomplished performer on a wide variety of instruments, and had mastered arranging and composing. As a trombonist, he joined the New York Amateur Symphony, and soon thereafter joined Ciro Rimac and his Orchestra as a pianist. Among the other orchestras with which he has appeared are those of Xavier Cugat, Will Bradley, Machito and Enric Madriguera. 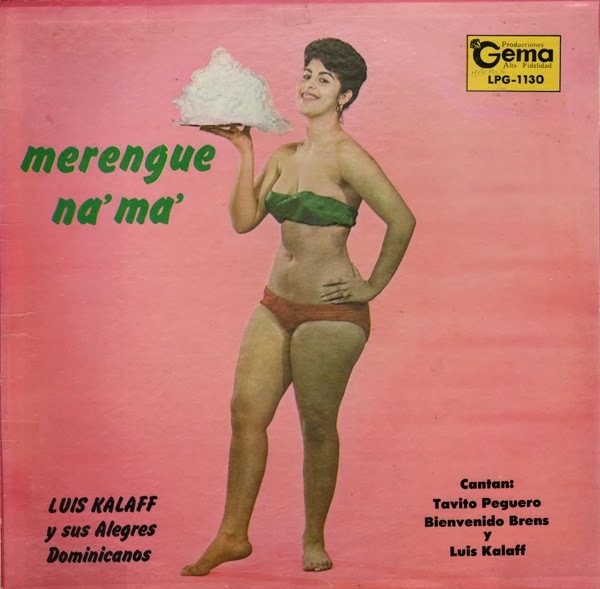 During the war, he served with the Air Force, and returned to form his own group and do his shining bit to advance the popularity of Latin American Music. The jacket, featuring a wicked Jim Flora cover art gracing an unusual (for period) RCA book-fold. The record inserts from the inside of the jacket fold. 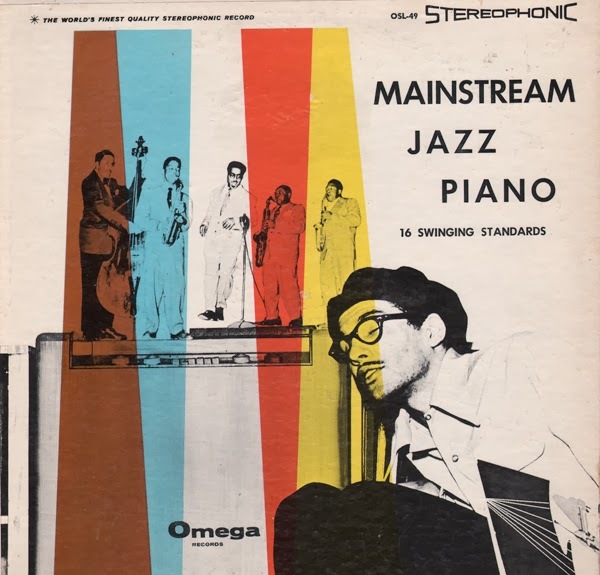 Enjoy a few samples from this super tight, sparkling jazz set. From the inside cover: Small, unassuming and blind, he is led to the stage by his father and then, all at once, the mood and tempo change. 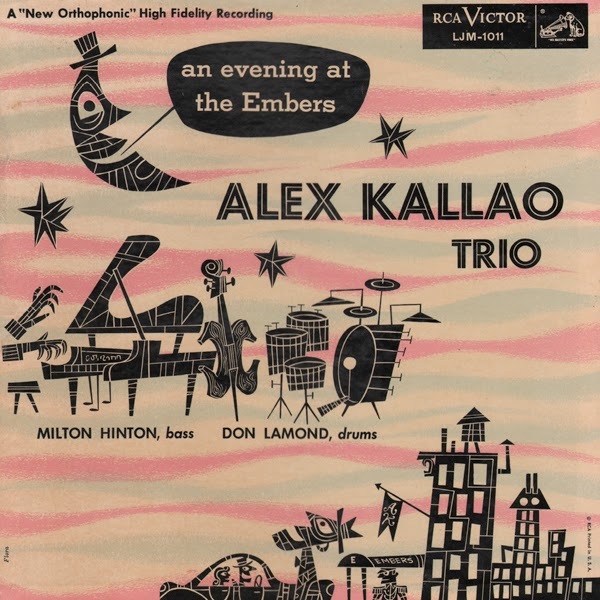 This was my first impression of Alex Kallao when I heard him at The Embers nightclub in Manhattan. He started out in Feburary of 1954 as an unknown. He created such a stir, that Time Magazine featured him in an article titled, Bach to Jazz. Like many top jazz pianists, he is at his best when accompanied by bass and drums. Only 21 years old, he has broken into the golden circle of top jazz pianists without ever having made a record. 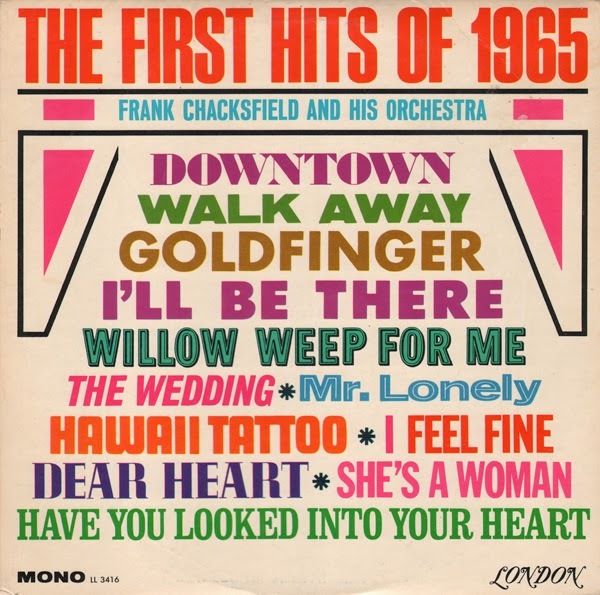 His is presented here on RCA Victor records for the very first time. Blind since birth, he began to learn the classics when he was only three. His father, himself a professional pianist, would sit down beside him at the keyboard playing a Beethoven sonata with one hand while little Alex's fingers followed an octave away. When questioned about how he learned to improvise, he said, "because of my blindness, I always improvised and made up little pieces." Today we feature another graphically bold Omega cover and several solid samples from the split record jazz set. From the back cover: John Evans is Belgian. Born in Antwerp, he took lessons from his woman-down-the-block, but didn't stop there. After the usual amateur bands, he turned professional at 15 with a dance band in Antwerp. At 19 he went to Brussels and worked in nightclubs. In 1951 he joined the Francis Bay Band and played with them when they won the Golden Gondola Trophy in the Battle Of The Bands at Venice. Besides his exciting piano soloing (of which your get a vivid concert here) he also does arrangements for the band. Reinhold Svensson, Swedish, is blind and learned to play by ear. He is one of the famous musicians in the Scandinavian countries, and his fame has already reached America and Down Deat via one earlier recording released here. He plays mostly in the Putte Wickman band which won first prize, in the Paris Battle of the Bands. Last year he was called to the Swedish Royal Court and played for the king.